September to me always feels like January….somehow a new beginning and a chance to review your goals, personally and professionally. I guess it’s because the kids go back to school and so do I. It’s an exciting time. Maybe, it’s also the sense of the summer coming to an end and the anticipation of the beautiful fall weather soon to arrive. One of the things that I think about this time of the year is how I can improve my organization both at home and at work. Also, when thinking about blogging and all that’s involved in running a successful blog, it’s important to make sure that my organization skills are on point. Now, let’s take a look how you can increase your blogging productivity with 10 easy organization tips. I use these tips to get organized and get my blog running more effectively than ever. I hope you find these tips useful for your blog work too. I can’t emphasize enough how important it is to take time to intentionally plan out your events and tasks for your blog. I like to create a monthly plan and then narrow my vision down to a weekly and a daily plan. If you’re not doing it already, make sure you are mapping out your plan in a notebook, directly on a monthly printed calendar, ie: editorial calendar, or create a template that you can use on your computer if you prefer. Also, to keep the different parts of my life organized, I like to list the following headings: personal, blog, family and any other headings that suit your life. I add these headings beneath the monthly calendar. Then, I brainstorm and record the different goals, appointments and tasks that need to be taken care of that month. Finally, make sure this is a visual task, not just in your head. Recording your goals is an important organization skill that you need to develop. When thinking about the importance of planning out your blogging work, I highly recommend you take a moment to read Lindsay’s post at White Oak Creative where she talks about the necessity to have a very clear purpose behind your blogging vision so that you’re addressing your audience’s needs. Once I have created my monthly calendar template, I then take 10-15 minutes and brainstorm on another page or document all ideas for the blog. I try to keep in mind upcoming holidays or seasonal events that will take place in the month. I think about what posts in the previous month were successful and then I try to go deeper with the topic or consider how to extend it into a series. Next, after I map out my monthly plan for the blog, I then create a weekly and daily to-do list. I really like the bullet journal ideas that so many are using right now. My journal doesn’t look that creative visually, but it’s useful in helping me to prioritize my tasks and keep track of my accomplishments and finished projects. So, try using a to-do list that will help you to stay on task and to prioritize your tasks. You can find additional tips on how to use a visual checklist effectively for your blog at By Rosana. As an entrepreneur or blogger, it’s important to create work hours that you can commit to and to help you to achieve balance in your life. Setting aside specific hours or blocks of time to dedicate to your blog really helps you to stay organized. By using your calendar and to-do list in a purposeful way, you will notice how much you can get accomplished within your designated work schedule. Next, a great organization technique that is used successfully by so many bloggers is to batch tasks together. For instance, you may set time aside to write all of your weekly blog posts. The next batch of time can be used to create graphics, or work on your social media plan, etc. In this way, you stay really focused and by regularly reviewing your calendar and to-do lists you will find an increase in how much work you can get done. As well as creating a work schedule, it’s an important habit to track how much time you need to complete a given task. This will force you to reflect on your efficiency and will help you to assess your own work habits to ensure you’re working as productively as possible. Time on task is what I call this. You want to maximize your time and try to be efficient as possible in completing your projects or different elements of your blog work. This is also important in your efforts to create balance in your life and not get overwhelmed with work. Be mindful of your time! Now, it’s great to have a to-do list but if you don’t have clear deadlines set and actually follow them, then your to-do list is useless. The goal is to actually check off completed tasks from your to-do lists. This may be obvious but it’s important to actually plan to eliminate distractions. You may need to communicate your work schedule with your family and others so that you don’t get interrupted. Keep this in mind. Another tip to improve your organization skills is to identify the key times or days that you are most productive. When are you most energized and focused? Recognize this and match your productivity times to your work schedule as much as you can and batch your tasks accordingly. Truly, how can anyone work effectively in a space that is messy and unorganized? To do your best blogging work, you need to designate an area in your home specifically for your blogging. This space does not need to be extravagant. It can be simply a small table or work area anywhere in your home. Just remember to keep all your necessary materials and tools that you use for your blog in this specified area. Try to keep is bright and clean. Why not add a plant or two to liven it up? Also, add some art to your space with a great graphic or inspirational quote. 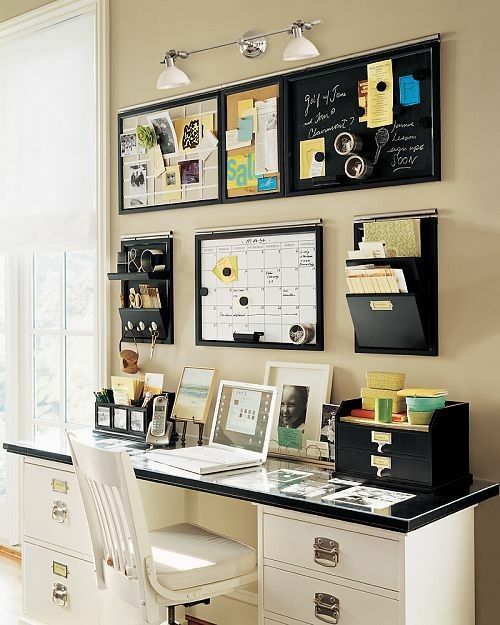 I love this small work space that Julie at Mom Fabulous shares. She shows us a great example of a small home work space. The key to successful blogging is organization. This is vital particularly when you’re a beginner blogger or blogging as a side hustle. Managing and maximizing your time is essential. I’m always talking about finding balance in life and creating the life you always dreamed of. By following these 10 organization tips, you are a bit closer to making your dreams a reality. Now it’s your turn. What organization tips work best for you when you are working on your blog? Take a moment please and share this post with others.